On Wednesday, the Stanford Political Union (SPU) held its latest event aimed at putting differing views in dialogue, hosting two professors to discuss current issues with Stanford’s Title IX and other sexual violence policies. 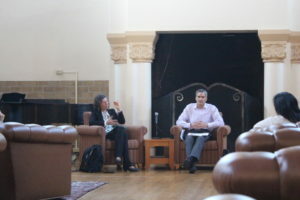 The discussion featured psychology professor Jennifer Freyd from the University of Oregon and Professor John Villasenor, a visiting fellow at the Hoover Institution. SPU member Jackson Lallas ’19 moderated. The current policy of mandatory reporting and the lower standard of proof required in University processes compared to criminal cases were chief issues of concern during the discussion. Freyd identified the common policy of mandated reporting as one of the primary areas she felt needs improvement. At most universities, including Stanford, this policy requires employees considered “mandatory reporters” who become aware of an act of sexual violence to report it, regardless of whether the victim wants it reported or not. Some universities may define all employees as such. However, mandated reporting under this policy does not promise confidentiality, something Freyd seeks to reform. Freyd suggested a shift to a more flexible policy in which neither faculty nor staff are compelled to report cases of sexual misconduct, but rather are encouraged to talk to the victim to find out what they want and support them accordingly. A fundamental problem of the existing policy, she claimed, is its potential to add to survivors’ trauma by taking control away from them. “One of the most harmful things to do to a survivor of sexual violence is to take away their control,” Freyd said. Freyd has focused much of her research on institutional betrayal, or the psychological effects of institution such as universities failing to respond appropriately to cases of trauma. In her studies, she said, she found an institution’s poor or inadequate response often caused nearly as much damage as the incident at hand. Villasenor focused specifically on the risk of false convictions as a result of the lower burden of proof required to find someone responsible under a university Title IX process. A 2011 “Dear Colleague” letter from the Department of Education instructed schools to use a “preponderance of evidence” or “more likely than not” standard in adjudicating cases, rather than the higher “beyond a reasonable doubt” standard used in criminal court. “Preponderance of evidence” is used in civil court. Villasenor described research in which he predicted the number of false convictions of the accused, taking into account that the burden of proof is much lower than in criminal cases. Villasenor is concerned that this different standard could lead to substantially higher wrongful findings of guilt. Freyd pointed out that there are many instances in which victims seeking justice could be reluctant to pursue a case if the burden of proof is too high. Both Freyd and Villasenor agreed that before making any substantive changes to the Title IX process, especially concerning burden of proof, more research would have to be conducted and more alternatives evaluated. Nonetheless, Freyd feels that the conversation is moving forward. “We are better prepared to have a dialogue than we were five years ago,” she said. Contact William Dunlop at wjdunlop ‘at’ stanford.edu. William Dunlop is an undeclared major freshman writer for the University/Local beat who really enjoys music and anything associated with it. He calls the many towns of Amador County, California his singular “hometown.” He’s probably in Wilbur Dining criticizing their breakfast music choices, or with the incomparable Stanford band running around somewhere. Contact him at wjdunlop ‘at’ stanford.edu.